Sometimes, you have games that have been around for a while but they are not the definitive version. Often these are available in Early Access for a while and players can insert feedback to help improve the game. 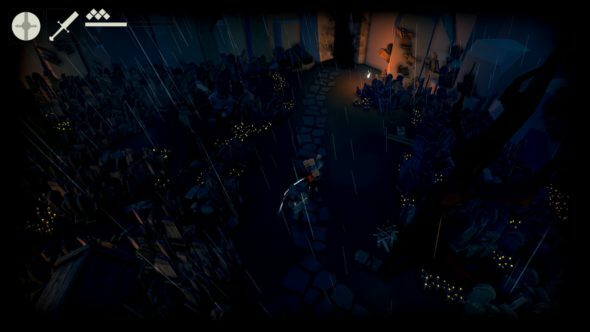 Fall of Light: Darkest Edition is an example of this sort of game. With an original release in September 2017, the developers of the small Italian game studio RuneHeads still had a lot of work to do, to optimize their game. We can now finally start to enjoy the full game! The definitive version was released last summer on PS4, Xbox One and Switch. Since last month the game is available on PC as well. 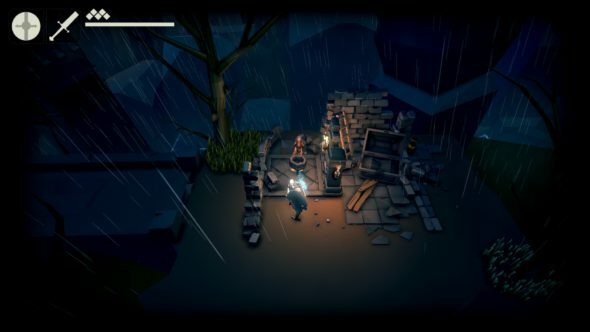 In the dungeon crawler, which is inspired by games such as Dark Souls and ICO, you are an old warrior who has to lead his daughter towards the last remnants of sunlight. In the beginning, there was only darkness. Eventually Luce brought light to the world and for the last thirteen eras everyone has lived in peace. But then an evil wizard named Pain raised and took Luce. In the epic battle a lot of good men died and eventually Pain defeated Luce, making the fourteenth era the first of darkness. During the game, you will be playing as an old warrior with the goal to bring his daughter, Aether, to the last remnants of light. He has to do this in order to overcome the darkness that has everyone in a tight grip. 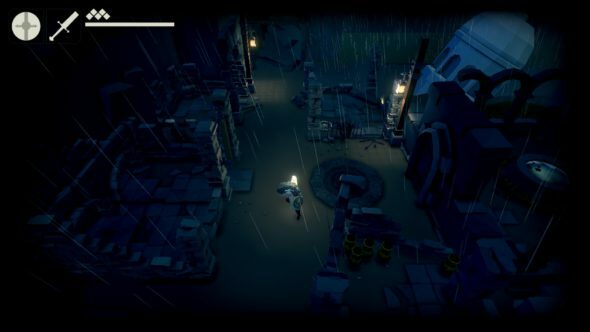 Fall of Light: Darkest Edition uses 3D-graphics but combined with a more fancy and cartoony style. As we mentioned in the story before, the game takes places in the darkness, which is brought back by Pain. While playing the game, you’ll immediately find out that the developers really took the time to make sure this comes back in the graphics. The details that have been implemented in the game are also real eye-catchers. Everything is simply designed and not over the top but then again, also detailed in the right ways to give the game a special and enjoyable look. This also makes you want to explore new areas just to see how everything looks. The sound effects that you experience while playing the game really match with what is happening on screen. They aren’t the most beautiful or perfect ones out there, but still, everything fits right in with the theme of the game. Talking about the theme, the music that you will encounter while playing also makes everything much more interesting and benefits towards the dark/sinister feeling the game is trying to provide. Like we mentioned before, it’s not really all that, but at least it’s there. However, if we look at the voice-acting, this is done incredibly well. Right at the start when the story gets told, the voice you are hearing really gets to you. It’s safe to say the developers hit the bulls-eye with the voice-acting. Fall of Light: Darkest Edition is a story-driven dungeon crawler in which it is your goal to fight yourself a way through the darkness and bring you daughter towards the last remnants of light to defeat the evil wizard Pain and stop the darkness. 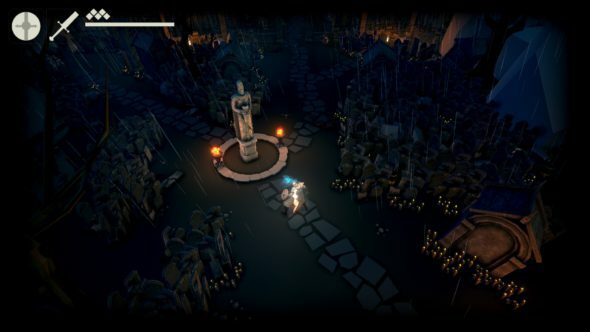 The game is heavily inspired by games such as ICO and Dark Souls. In order to get to the last remnants of light, you will have to take on shadows, soldiers of darkness and underworld bosses. To defeat them, you can use a wide variety of weapons going from short to long range weapons. The different kinds of weapons can be found randomly on your journey and you will most likely switch a lot. However, when you are in battle, the combat feels really slow and because of this, you might experience it as rather frustrating rather than it being enjoyable. This is a real shame since the battle aspect could’ve really made the game. When you are progressing in the game you will find Shrines of Power along your way. When you and your daughter kneel in front of them, you will trigger them and they will be set as your respawn point. However, they will most likely feel as a reset since literally everything you’ve done after that point is undone and you will have to defeat every single enemy again. No easy walking through here! The controls that are used in the game are simple and not that hard to understand, yet a small tutorial on the combat system would have been nice to learn the basics right from the start and actually give you the feeling that you know what you are doing. As mentioned before, while being in combat, it all can feel slow. Not to mention you will most likely experience a bit of lag, which no one ever likes. While progressing in the game, the feeling of lag will become a constant factor. It isn’t super noticeable, but the controls just aren’t reacting immediately, which can be rather nerve-wracking at some points. From the moment you start playing the game, the story really gets you to and makes you want to discover the rest of the game. Combined with beautiful graphics, the whole is even more enjoyable. The sound aspect is present but the sound effects and music are not that great, however, the voice acting in the game is absolutely stunning. So are there any real bad points? Well, the gameplay may feel a bit laggy and while being in combat it all can be experienced a bit slow.